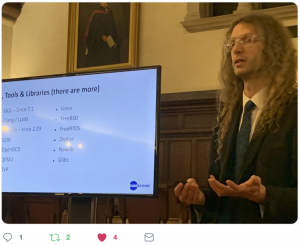 “This is where we do RISC-V meetups in Cambridge” is a great way to sum up the recent first RISC-V Meetup in Cambridge co-hosted by UltraSoC and Imperas. Colleges in Cambridge possess a certain grandeur and architectural style. Westminster College was certainly no exception. 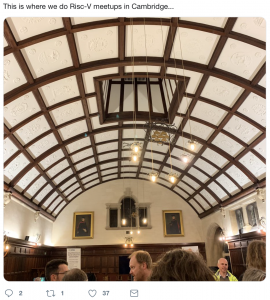 Within the wonderful high ceiling of the dining hall and the exquisitely painted framed pictures of principal college figures looking down from above, the tone and ambience was set for a great evening. 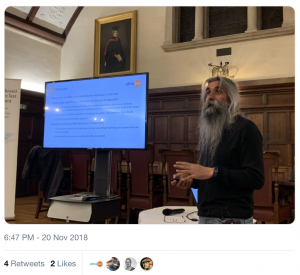 As with last month’s Bristol RISC-V Meetup there was a full and engaged audience that joined us to hear about the latest developments in RISC-V and to see some live demonstrations. The great thing about meetups is their informal nature, and engineers welcome the platform to be able to gain valuable insights into what else is going on in the industry outside of their own projects and companies. 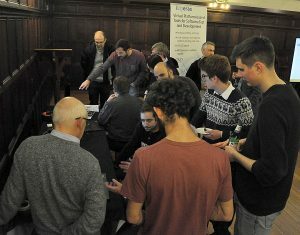 This environment meshes perfectly with Cambridge’s strong ecosystem, from students and local start-ups, through to established companies such as Arm and Qualcomm, all coming together to share their knowledge and experience on a level footing, which is what makes it such a successful network in the city. It is apparent that there is a lot of research and analysis going on, and as a result that is also highlighting a number of challenges that need to be overcome, hence the grasp of the strong value and need of the open source RISC-V architecture. Graham Markall of Embecosm, who kept up ‘the look’, then gave an interesting talk around their active RISC-V projects, and provided food for thought that there’s stuff out there, things are happening, people are thinking about more than just “open source, isn’t it great, brave new world etc”, but actually moving on and DOING stuff about important issues like security etc. 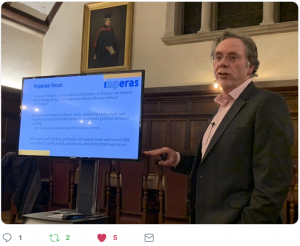 Then followed Simon Davidmann, CEO of Imperas, who talked about the challenges for RISC-V and the importance of conformance testing and no fragmentation. During refreshments the technical demonstrations by Imperas and UltraSoC drew a lot of interest and engagement. Intriguing questions around how big the UltraSoC blocks are, how are they verified, timestamps etc, through to what happens to the data coming out of the system. Overall there was a good level of understanding and appreciation of the technology and people are interested in its progression. With the success of this first Cambridge RISC-V Meetup, and the first one in Bristol, we are certainly encouraged to arrange more. Please join the Bristol Meetup group and the Cambridge Meetup group to be kept up to date with dates for the next ones. We look forward to seeing you there.